Forgiveness is a funny thing… we all know it’s hard to forgive… but also sometimes, just as hard to ask forgiveness as well. I remember as a child going over to my friend’s house playing in the family lounge room. I took her wedding barbie and she started chasing me for it. Things somehow got a little rough and she accidentally hit an antique cabinet which housed one of her Mom’s favourite figurines. Who was to blame we weren’t exactly sure. Of course she physically knocked over the figurine, a little Chinese Budha made from ivory… but I took her barbie doll and hence that’s what started the commotion in the first place. For a few minutes, we were in an impasse as to what to do. Were we going to try and find some glue to fix it up, blame the dog or fess up? In the end, she asked me if I could just tell her Mom that I did it. I shrugged my shoulders and said yes. When we were older, I asked her why she asked me to confess when we were equally to blame or if not, she was more at fault that I was. “Because I knew you wouldn’t mind saying sorry.” she told me. I guess, to a certain extent it’s true. It must be a family trait. One of the first things that bewildered my husband about my family was the number of fights we could have in one meal. The most he counted, or so he says, was four different topics over the course of one very long lunch. Not arguments – but blown out fights, with shouting and crying. Not really surprising when you have a family of six very very VERY stubborn and opinionated people. He said, when he thought that the topic had been resolved, he was surprised that a few minutes later a new issue was brought up. But also, he was even more amazed at the ease at which we were willing to say sorry and the ease that we were willing to forgive. In the Philippines, sometimes, they say this is a bad thing. People say you have a “pusong mamon”, or a soft heart. To some – as sign of weakness…. Call me naive but I personally like to think that I’m an eternal optimist. Anyway, how pleasant can life be if you can’t find it to forgive? After all, at some point in time don’t we all make mistakes? Further, as I’ve learned from past experiences – how awful to go through life thinking you’ve hurt someone and not being able to apologize for it? Forgive the dramatics. It must have been the trip last week that’s brought about the introspection. One night, we were having dinner, we all must have been tired, hungry and cranky and some petty comment led to another and before we knew it, we were in the train station arguing. Can you imagine all of us ladies shouting at each other in front of so many strangers? I can laugh about it now but back then – it was serious stuff. So to cut the story short – it was all my fault. I said somethings to my Mom that I shouldn’t have. And I knew it. I knew I had to apologize but I didn’t know where to begin. Believe me, sometimes it’s just as hard to apologize as it is to accept it. I kept thinking “okay, in the next two minutes, I will say sorry”… and then two minutes passed. Then I thought “I will apologize when we are inside the train and sitting down”… and then we got on and sat down. “I will apologize when we get off our stop”… but still I couldn’t. Until we reached the night market and then I said sorry. She said something I will never forget. “It’s okay Trissa. I’m used to being a punching bag.” She said it… no malice… not to make me feel bad… but just the truth. I tell you – I don’t think I could have felt more low. But an hour later we were all back in the hotel room. Laughing at how my sister could have gotten so many blisters from walking. Oohing and aahing about our buys. All was forgiven. So… what does this have to do the with delicious pillow like chocolate fritters that I made from Mario Batali’s cookbook? Nothing really… but I hope you will forgive me for it. I would forgive anyone with yummy treats! Trissa I love your story. These little “pillows” are beautiful. I’m going to try them too. a lovely post!! and having a soft heart is so much better than a cold hearted one. but seriously you captured my heart and every other bit of me with this – i love it and am sure soeren (son) will too! Can I just sift through the posts I missed and leave ‘drool’ comments? These look amazing, and the combo of chcolate nnd pistachio ‘seems’ sort of rare for some reason, no idea why since it’s perfection 🙂 I can almost taste the deep fried goodness. With my brother, fights blow up if they’re bad (but don’t happen often) but usually within a few hours we’re okay. We’re not a big “fight” family, but they happen now and then! Anyways, these look delicious. Your stories are always so heartfelt and honest. Beautiful in so many ways. As I read this on Valentines Day I can’t think of a more appropriate post. Isn’t that what life is all about – being able to forgive. I’m sitting here feeling mellow and peaceful and I know I am going to have a great day. Thank you for a beautiful post. It just goes to show that while we are all different we are all so the same. And, plus ,the chocolate pillows look delicious. Happy Valentines Day! Thank you for another one of many heartfelt, wonderful posts, Trissa. I can’t think of anything better to immediately remind me of what I missed so much about the blogging community. I totally agree with you that the willingness to say sorry and to forgive is not a weakness at all. In fact, I think people really get in trouble when they become hardened in their views and their ways so that they can no longer yield to what’s right, even if it’s difficult. Coincidentally, I just had (and often have) a big blowout with my mother. Glad you worked yours out. Happy early New Year and Valentine’s Day! Trissa, this is a beautiful post! I love how you guys forgive each other so quickly. It’s a good lesson for me to live life with a soft heart. I love your blog and the images of each post… have a great weekend! So yes, let’s be optimistic shall we? 🙂 And who can be anything but optimistic in the face of those fritters??? Want some now! Good work Trissa. Life is too short to worry about little things. Forgive, forget and move on. on February 12, 2010 at 4:53 am | Reply Nurit - 1 family. friendly. food. Oh, Trissa, what a story. Especially the one with your mom. I know it can be hard to say sorry but even worse not to and live life with anger and frustration buiding up. Those who don’t sorry doesn’t mean they don’t feel bad but instead of talking they continue to carry it around. Such self-punishment. The first time I said sorry was the hardest. It does get easier each time. Trissa……………heartfelt emotion, melted chocolate. Beautiful photos… too. Please leave our BM ALONE……..we ♥ her! Oooh waw,…Trissa!! 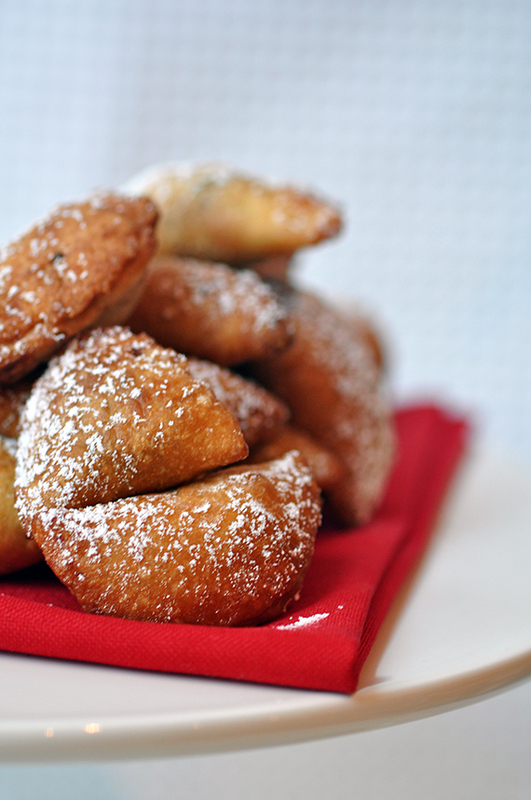 these filled fried pockets look amazing & so damn tasty! Lovvely food!!! Excellent pictures too! Oh, what a nice post Trissa. And the fried pillows look wonderful. Fabulous looking pillows by the way. Oh what a nice post.. I think there’s nothing weak about apologising, so long as it’s genuine. Those choc & pistachio pillows look declious! What were they like?! Something I am envious of incidents like these. As the only child, there isn’t exactly anyone to fight with and make up. I am referring to siblings. Om nom nom. Those chocolatey insides look incredible! Beautiful dessert & beautiful story again, Trissa! Love both. It’s true that forgiveness is hard. I’ve experienced it many times especially from people who purposely did me wrong. But I’ve found that forgiveness sets me free to move on. you had me with the picture of center of the deep fried pillows! 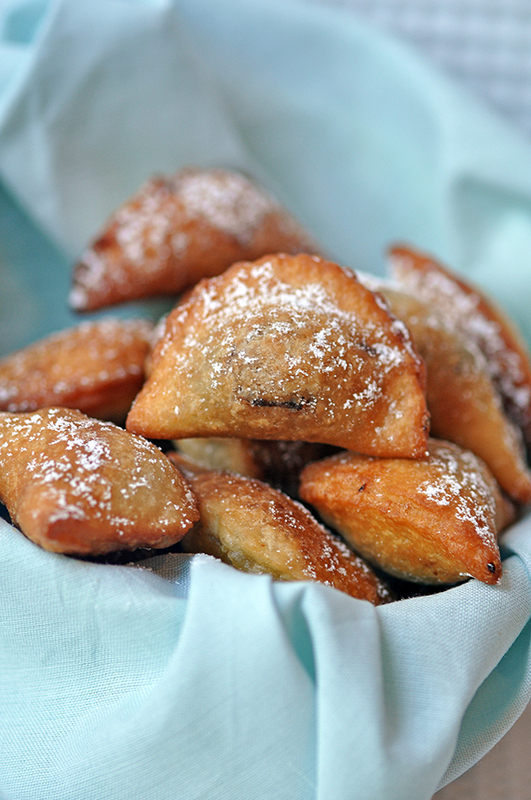 I love deep fried anything and to combine it with chocolate is just too yummy! when asked forgiveness. Life will be happier n easy when we know how to do both. Felt so hopeless looking for answers to my quetsinos…until now. I can’t take my eyes off of those molten chocolate filling inside……. i want to lick my screen. That is a lovely story Trissa… I do think that being able to say sorry is certainly not a weakness but more a strength! If only more people were able to do so maybe life would be a little bit easier sometimes! And those chocolate fritters look absolutely gorgeous!! These fritters look so cute. love the post. Saying sorry has to be one of the hardest things ever. Especially if you know you are in the wrong. I think your little deep fried pillows would allow anyone to be forgiven! 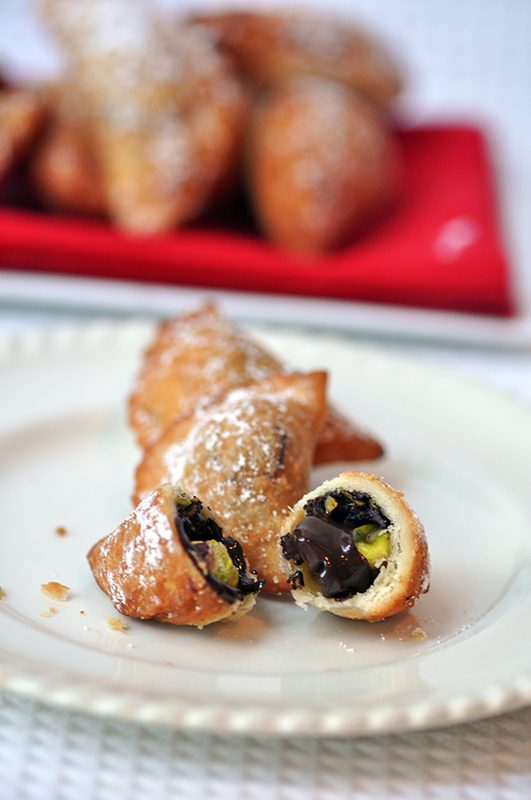 Chocolate and pistachio is a great combo, especially deep-fried! Fantastic! that was a cute story! keep them coming. I forgive u for making me far with all these calorific sweets!! I can so relate to that incident.. my granpa used to say ” saying Sorry is the easiest thing to do. It costs you nothing to say but gains you so much” . but sometimes it’s the hardest thing to do and usually family, since you take them for granted, end up holding the short stick… oh well! all in the family! I will forgive you for that, but I may not forgive you for hurting my eyes by making me squint at the monitor, trying to figure out what is inside these beautiful little parcels… I could have sworn that lump of chocolate on the right hand side was an olive! I also may not forgive you for making this tired girl lust after delectable little pillows of chocolatey pistachioey joy at 11:40pm. I hope it’s easy in my family to say sorry. Sobrang ma-pride and members ng family namin from my mom. Beautiful as always. I love pistachios so this really an indulgent piece for me. You’re absolutely right, it’s so hard to forgive but we have to and it’s also hard to apologize. Life! Over the years, I’ve learned the value of asking forgiveness, especially since – unlike your and your family’s openness – I bottle up those little resentments. Unfortunately, they only fester in my mind into something completely different and terrible from the original conflict. Now, if I say or do something rash because of temper, I try not to let the day end without apologizing (have to give myself the day so that I can wallow in a self-righteous snit for a little while). An angry heart sits heavy in you; I’d rather have a happy heart! 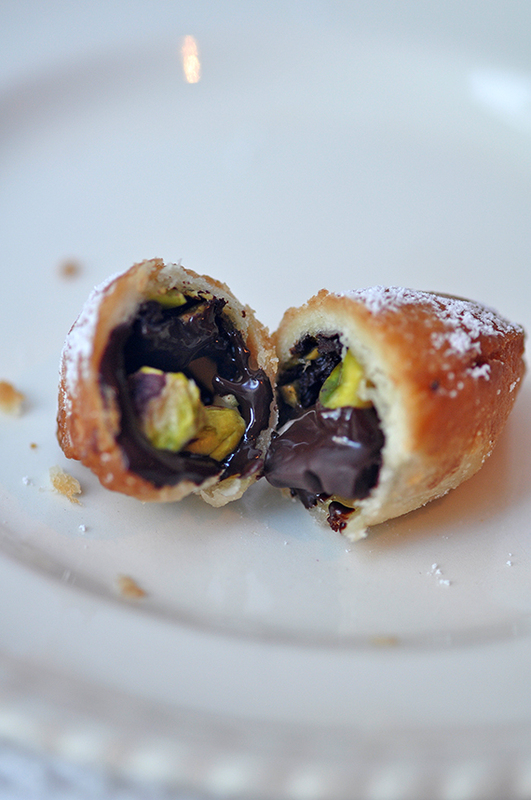 That is one amazing combination–fried chocolate and pistachios… molto Mario does it again… and you did a perfect homage! Your posts are always so insightful and beautiful, Trissa … I relish every word. The fritters … what can I say but wow. Of course they are. They came from you! You’ve pictured a very true story that would happen in every family everyday. Sometimes we might feel it’s not to hard to say sorry, sometimes we don’t. But I always think whoever knows his/her own faults and says sorry first, he/she is the bravest one. I will look upon those who have the courage to say sorry, rather than looking for anyone who won’t make any mistakes. In fact, everyone makes mistakes everyday. Love your stories, Trissa. We weren’t much of an arguing family, avoiding confrontations for the most part. Having a soft heart to apologize for breaking a doll when you were a child was a lovely gesture. You probably recognized it was partly your fault. And your friendship might have been at stake. Your friend’s comment was really a compliment. Anyway: love the chocolate fritters! Awww Trissa 🙂 My sisters and mum and I fight alot and I mean ALOT as well but we have this unwritten rule that we don’t stay “fighting” for too long even if we don’t apologise to each other… these chocolate pillows are so moreish!